When starting out in the job market, first-time jobseekers often struggle to create resumes that stand out to employers. In entry-level candidates, hiring managers are looking for exceptional qualities and employable skills that make up for the lack of experience. To capture their attention, a strong resume should present your hirable traits and reflect your personality in a professional light. Using first resume templates and examples, you can learn how to write a job-winning resume with little or no experience. Through examples, discover how other entry-level jobseekers strengthened their candidacy, such as utilizing proper formatting and emphasizing their employable skills. From composing an engaging professional summary to compiling an impressive experience section, learn the tips and tricks to nailing your first resume with style. Why Use First Resume Templates? Often the first step is the most difficult. Fortunately, first resume templates provide the building blocks for a successful entry-level resume. Templates offer a foundation, incorporating the basic resume rules and formatting, from which you can construct your own job-winning resume. Until recently, most resumes were not to exceed one page. Though single-page resumes are no longer the standard, one-page first resume templates are still useful for first-time jobseekers with limited work experience. Because they are condensed, resume writers need only include the most important professional qualifications with minimal detail. They are excellent options for entry-level or part-time positions that don’t require much experience. For those seeking entry into nontraditional fields or those who are simply more courageous, creative first resume templates can garner employer attention through a one-of-a-kind presentation. Typically, they encompass unique formats, incorporating visual elements such photos or videos, unorthodox themes, and bold design choices. Creative resumes may be risky but can pay off in certain fields like advertising, media, and the arts. Basic and simple first resume templates give your resume a clean, traditional look. And though they are comparatively straightforward, they don’t need to be generic. Simple styles are smart choices for more conservative fields, such as government or healthcare. Using streamlined, easy-to-read layouts with tasteful design elements, such as accented colors, basic templates are useful tools for first-time resume writers. Most first-time jobseekers lack the necessary job history to support their experience. 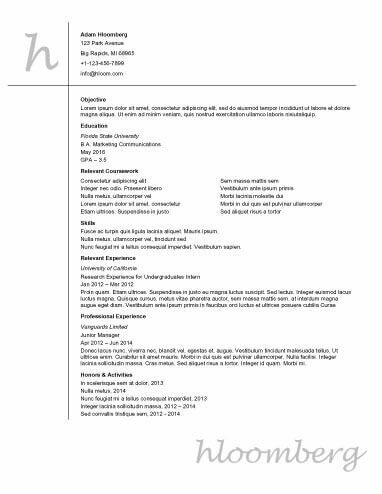 Entry level first resume templates incorporate basic design themes and formatting that emphasize the potential of the candidate. They are ideal for guiding new jobseekers through the resume-writing process, laying out the resume-writing foundation that entry level candidates need to succeed. Clean first resume templates offer a streamlined layout that utilizes typography, color, and white space to give your resume a professional, tasteful look. High-volume hiring managers prefer these resume designs because of their readability and straightforward presentation. For this reason, many first-time resume writers opt for a clean style to capture the attention of employers. Nearly all first resume templates incorporate the same basic core sections. With that in mind, employers expect you to provide adequate information and detail under each heading. Here’s a useful checklist of what’s involved in each section of the resume template. Pay attention to the kind of information employers look for in a job applicant and discover how to incorporate it into your resume. First and last name: Employers need to know who you are. Avoid informal names. Middle names are not necessary. Telephone number: Provide a number where hiring managers can reach you. Both your home phone and cellphone numbers are acceptable. Home or mailing address: Give a permanent mailing address. It does not have to be your current residence; PO boxes are acceptable. Website or social media profile: In the digital age, online profiles and personal websites are more common. Provide a link to your social media page, though only if it’s professional. State your objective: In the first line, tell the reader your intent and the position you seek. You should also include a brief description of your experience, even if it’s entry-level. Be clear and concise: Generally, your professional summary should consist of no more than 4–6 lines. Incorporate industry-specific terminology: This shows employers you have an understanding of your field. It’s an easy way to demonstrate experience with concise language. Employ sentence fragments: Use brief phrases in a bullet list without periods at the end. Incorporate key industry phrases: Target phrases show your understanding of the field and strengthen your skill set. List 7–8 skills: Present your skills in two columns to save space, with 3–4 items in each. Begin with your most current work experience: List your earlier experience in reverse-chronological order. Emphasize the positions that are most relevant to the job you’re applying for. Use active language: Start each line with an engaging, precise verb. Active language offers more insight into your role in previous positions. Include 5–8 bullet points under each job title: The work history section is your chance to go into detail about your experience. Include specific responsibilities as well as your achievements. Begin with your most recent degree: List older degrees in reverse-chronological order. Describe areas of concentration: Provide any majors, minors, or specialties under each degree. List awards and recognition: Share any honors or special academic achievements when appropriate. Once you’ve selected your favorite first resume templates, you’re ready to begin crafting your resume. Our resume builder is an easy way to navigate the technical challenges of document formatting. It simplifies resume writing while offering additional examples and insights for comparison. • Cover Letter Templates: Learn the necessary content and formatting needed in a strong cover letter. • Design Features: Arrange your information into a variety of appealing and professional designs. • Digital Resumes: Create a resume that you can distribute virtually in numerous digital formats compatible on most online job post forums and networking platforms. • Writing Advice: Gain access to tips and hints to improve your writing skills and increase the effectiveness of your language.